Paul Taylor and his Retro experience have a pedigree preceding Pioneer. 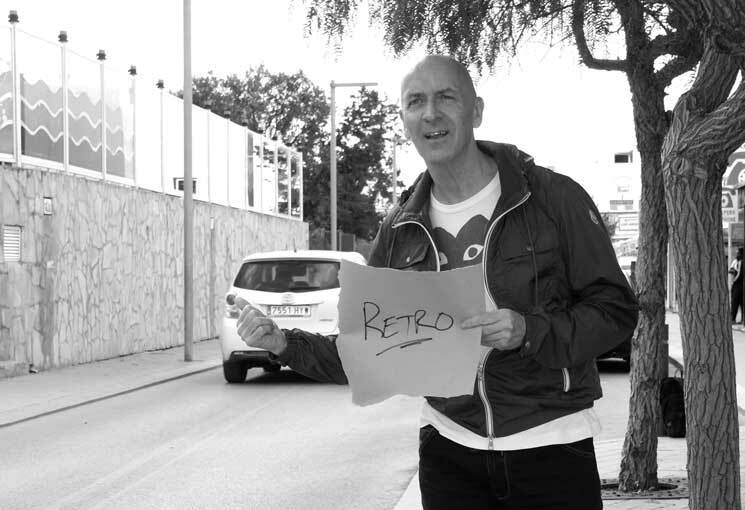 Starting a DJ career in ‘74 spinning heavyweight 78rpm discs on a pair of HMV wind up gramophones (probably), Paul Taylor returns to Ibiza for 2016 bang up to date with everything from years gone by. We’re getting confused – time to call upon the DJ time lord. Next stop Retro. NG: take us back to ‘74 Paul, how did it all begin? PT: my early days were all about soul and funk. First it was northern soul, then the next big scene I took to was jazz funk which was really big in ‘75/76 and that moved into disco a year or two later. Of course we had no mixers and so I would segway from one track to the next which basically meant knowing the tracks well enough to use the end of a verse or part of a track with no beat to segway into another tune. And of course the microphone was an important tool. Cheesy, but important. NG: did you enjoy a dance yourself back in the day, did you take to the floor for a bit of northern soul? PT: no, northern soul escaped me but I could watch them dance all night, incredible. I could dance to jazz funk though. The early days of northern soul and jazz funk also instil the love I have today of vocal styles which is what Retro has always been about. NG: something about nothing Paul, but do you remember a mid-70s jazz funk track called East River by the Becker Brothers? PT: yes sure, a great tune. NG: (shaking Paul firmly by the hand) thank you, thank you so much, in all these years it has stayed towards the front of my singles box and I have never yet met a DJ or anybody come to that, who has heard of the tune let alone liked it. PT: ha-ha brilliant well that is what retro is all about. NG: that said, I guess many of us think of the heyday of vocal house as the very late nineties and very early noughties. Is that retro? PT: of course it was a real heyday for some great tunes and so a lot of what we play comes from that era, but retro is about far more than that. If it is a good tune with a strong vocal it can come from any time. You might find us picking up on a track from just a few years ago, often one that didn’t get the airplay or attention that it perhaps deserved, and we will bring it back as a retro classic regardless of the time it was released. So we keep evolving. The name maybe Retro but we keep our nights fresh. That is our secret to success. Big tunes you’ll hear at Retro …. NG: if retro started in ‘89 what was there to look back at? PT: Good question. For many people ‘89 was the beginning of house music but of course it was already established for several years in the Chicago scene and also a couple of years for the very early UK acid house. NG: speaking of Chicago, your date of birth rang bells to me. Were you born the same year as Frankie Knuckles? PT: ‘57? Yes I do believe I was. I have a very strong feeling and connection with the early scene in America. I had my very first party with my wife in the Limelight in New York (a delicious cheeky smile came over Pauls face as he described this, indicative of some very good memories). That must have been ‘86 and so for me the journey with house music started in America, that’s where I fell in love with it. It was an exciting time, and an important time. Disco was really over and journalists were saying dance music was on its last legs, it wasn’t going anywhere. I remember writing to Record Mirror telling them I disagreed with their ‘death of dance music’ opinion and pointed to North American house. NG: did they print it? PT: yes they did, I think I still have it in my loft somewhere. I can’t remember the name of the guy at Record Mirror but at the time he was the UKs main voice on the scene, I told him that from the days of the waltz, dance music has gone around in circles. NG: the waltz certainly did. PT: ha-ha, yes it’s all about the four four. House music is a very simple thing, don’t quote me on this (I subsequently gained Pauls agreement to quote this as I don’t see anything wrong in it – we all know what he means) it is white man music, easy for anybody to keep in time to, unlike jazz and funk where you might need a greater sense of rhythm. One of the reasons Retro has been so successful is because a large proportion of our market are girls. Sometimes we have 70% female and 30% male and that makes it popular with the promoters. NG: so did your involvement with the Chicago house scene mean you skipped by the emergence of UK acid around the late 80s and summer of love? PT: to some extent sure, and while the acid scene and emergence of Balearic house over here was happening, I was pushing the Chicago house style on my own club nights in the north of England. I remember in the very early editions of Mix Mag which were in black and white, Pete Tong and I both had our own columns on what our biggest tracks were at the time and there was definitely something of a north-south divide. There has always been that divide and I have always said the north of England is much more passionate about music than anyone else in the UK. NG: this interview is over. Thanks for your time and wish you a successful summer. PT: ha-ha. How to win friends and influence people right? NG: absolutely, actually I do understand something of what you mean; I’m not going to concede it as a permanent state but definitely in the late 80’s and early 90’s the north of England was a very special scene. We talked about it a lot with Graham Massey of 808 State quite recently and the music tree of Manchester at the time was just awesome. PT: that’s right. I started my first label in Manchester and made my first successful record in Manchester with Kylie Minogue. NG: brilliant, I knew we’d get to Kylie. Let’s talk Kylie. Beautiful, beautiful Kylie. I have been hoping you are not going to tell me that you laid down the music and she did the vocal somewhere else. PT: no, we worked with her. I was DJing at Angels in Burnley who were big in the underground house scene and Pete Waterman came to see me on a Saturday night. He was working with Kylie at the time and she was number one in the UK charts with Jason Donovan. I then got a call from him on a Wednesday telling me he wanted me to get to a studio in London the same night. I explained I had no production or musical background but he said all he wanted was me and my record box. So I got on a train from Manchester, arrived at the studio in the night and stood in front of me was Kylie saying “hello Paul, pleased to meet you”. They wanted one track on her new album as a dance number I used to play a tune called ‘keep on pumpin it up’. He said Kylie likes it and I want you to produce it. Pete put his best engineer on to show me the technical side of production and we put the track together under the name Visionmasters, which was the name of the night in Burnley where I was playing this track with Kylie now singing the acapella that I used to put on top of it. The song became a big club dance hit when released in November’ 91 and peaked at 49 in the UK singles chart. NG: that’s all well and good Paul, very interesting, but you managed to tell me the whole story without mentioning how hot Kylie was. NG: I beg to differ Paul. (I turned to some prepared images I had searched of Kylie in advance of our interview including a cover of ID magazine in 1991 on which I am sure any mortal person, certainly any heterosexual male would agree, Kylie is indeed somewhat hot). PT: I’m glad you have done your homework on that. Ok, she was hot. Wow, if she looked like that I am sure I would have remembered. Wow, Kylie was stunning. NG: Paul, you do realise that you have already said Kylie was not hot. NG: what was she like to work with? PT: superb. In the studio she was such a likeable and approachable person and took the music incredibly seriously. NG: much as I’d like to dwell on Kylie for the entire interview, we best get onto matters pertaining. Your Ibiza history started in San An to great acclaim? PT: yeah our first year we were voted best new night by Mix Mag, I’m very proud of that. We were known as the Manumission after party because we were on Tuesdays and they were on Monday. I think it is one of the reasons we got off to a great start because people were going straight through. We were getting between 2-3000 at Retro in Eden each week. It was phenomenal. But our return to Ibiza this year will be at Es Paradis. PT: well apart from anything else because Rick here told me to (Paul is accompanied today by his retro wingman Rick Bargiel). Rick has been a resident on the Island for well over 20 years and he contacted me late last year to tell me that a lot of people throughout the summer had been asking why Retro wasn’t around any more. I felt that the time was right to make a comeback. I personally feel in my gut that we should return too. PT: Having made a mark on Ibiza Town with Pacha and our amazing first year in San Antonio, both Rick and I felt that Es Paradis is the perfect venue. We are about a true human atmosphere vibe and this venue is steeped in a wonderful history. I honestly think that we make the perfect night together – it’s that simple. Our thanks to Paul and Rick. The Retro opening party is Monday 13 June and the night will run on Mondays throughout the summer season. Paul is also playing the Es Paradis opening party on Saturday 21st May.